The Jet Award trophy designed by Joe Putjenter a 1978 graduate of Omaha Westside High School. He was born in Omaha, NE in 1960. He attended the University of Nebraska Omaha majoring in architecture. 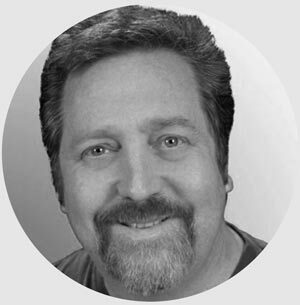 He is a member of the alumni from the previous Studio Academy, graduating in 1983 with a 4.0 grade point average. With wife, Lisa and his son Daniel the Putjenter family resides in Omaha. He is the current owner of Artistic Sign & Design where he has been blessed with a litany of outstanding creative projects, including the famed gate signs at Memorial Stadium home of the Huskers in Lincoln, Nebraska and the renowned tunnel walk arch leading into Memorial Stadium. He also sculpted the bronze “black shirts” wall for the Ndamukong Suh Conditioning Center. From church walls to carved impressions at the University of Kansas depicting Gale Sayers he has done it all. In the fall of 2011, Joe was approached by Johnny Rodgers and asked to complete another unique project. His assignment was to create a new style trophy for a long overdue award. The award would bear the name of a quick strike break away runner and a position that had yet to be properly recognized... the return specialist. That day Johnny asked for uniqueness and that is exactly what Joe delivered. The Johnny “The Jet” Rodgers National College Football Return Specialist Award trophy was taken by Joe Putjenter from the images of one of the most memorable plays in college football history. From a game that was dubbed “the game of the century” to a team that was voted the team of the century came a play that’s been called the return of eternity. To this day no play has ever withstood the test of time more so than the electrifying punt return by Johnny Rodgers in the 1971. In a battle for number one in the nation the first score of the game came when Greg Pruitt hit and missed Johnny Rodgers, igniting a run into history. It is at the precise moment that Joe Putjenter stopped time. He froze the action of the recorded play just as Johnny Rodgers broke away on a run that brought the return game into vivid focus, forever etched in college football lore. His original sketches captured five characters in the still pictures of the play. “Too many for one trophy”, said Coach Reed. So he eliminated two of the five. Later, he was persuaded to drop one more, leaving only the figure of Johnny Rodgers as he escapes from one of his best friends, Greg Pruitt, on his way to a run that continues to this day. The trophy conceived in the mind and created from scratch by Joe, captures all the greatness of the moment that refuses to die. One writer called it “the coolest award trophy ever” and its cool creator is Joe Putjenter.